Peppermint oil has long been used to treat a variety of ailments such as headache, nausea, stomach pains, fever and respiratory problems. The oil is also used in many everyday products, like shampoo, gum, toothpastes and body products for its refreshing and rejuvenating scent. Peppermint oil contains many important vitamins and minerals like iron, calcium, magnesium, vitamins A and C.
Peppermint oil is very useful in relieving and reducing symptoms or fever and respiratory ailments. Menthol, an important feature in peppermint oil helps, to clear air passages for better breathing and clearing the respiratory tract with fever and cold symptoms such as nasal congestion, sinus pain and stuffiness, cough and bronchitis. The most effective way to use peppermint iil as a fever reducer is to use the oil as a cold rub on the chest to clear up sinus pain and congestion associated with fever symptoms quickly. Apply two to three drops in a carrier oil such as sweet almond, avocado or olive oil and massage gently into the chest area for relief. Using a carrier oil will prevent any irritation from applying the oil directly to the skin for those who are sensitive. 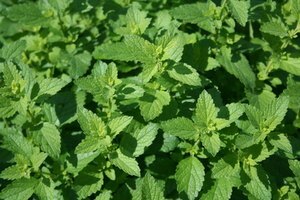 Peppermint oil is ideal as a fever reducer since it cools down hot skin, often a symptom of a fever. It also works to relieve pain externally from aching bones or joint pain associated with fever or headaches. To relieve fever and headache pain, apply two drops of peppermint oil into a teaspoon of carrier oil, and massage the temples and forehead for pain and headache relief. The oil will also help to relax the mind and body, allowing it to fight the fever effectively. You can use peppermint oil to prevent fevers and colds by taking it as a supplement in capsule form. The oil increases the immune system, helping it to fight off viruses through the flu season. To reduce symptoms like nausea, massage peppermint oil on the stomach area to relieve discomfort. Use five drops of the peppermint oil with a tablespoon of carrier oil and massage in a circular motion, helping to soothe an upset stomach. You may also use one drop of peppermint oil in a soothing tea or cup of hot water to relieve stomach discomfort or warm the body to sweat out the fever. Applying five drops of peppermint oil to the bottom of the feet has also been shown to help with nausea and fever symptoms, including body aches and pain. What Are the Dangers of Peppermint Oil?